First time poster here, and first-time pool opener. I recently bought a brand new Hayward S244S sand filter, and am about to open my winterized pool. I expect the water will be pretty nasty and I have a question about opening the pool: do I just set the filter to "filter" and let it run for a couple of hours, then backwash/rinse/switch back to filter? I saw a couple of videos that say to do this, but someone in the comments said "you shouldn't run the filter on a pool w/ green water." Were they insinuating to triple-shock the water *before* turning on the filter system? I guess I'm just unclear whether to add chemicals before or after turning on my brand new sand filter. 2) All that crud in your pool will have to get filtered out eventually. It doesn't really matter if you run on recirculate and then filter it all later, or filter as you go. I'd filter as I went along, personally, so I could actually see the progress. If you leave the piles of dead algae and dirt in the pool, every time you brush it will just cloud up again. 3) You add chemicals while the pump is running, so that it mixes well. 4) Don't add CYA granules through the skimmer the way a lot of instructions say. If you need to backwash before it's all dissolved, it's literally money down the drain. Enclose it in a sock and set the sock in the skimmer, taking care that it doesn't completely block the flow. A filter will not clear a green pool, chlorine will. The filter will catch the dead algae and other debris, but the chlorine is what kills the algae. I forgot to mention I'm filling my filter with Zeosand... most of the customer reviews indeed said to do a hefty backwash & rinse (a couple of times each, even) BEFORE setting the filter to "filter" mode. I guess that still needs to be done if your pool water is gross? I was just kinda hesitant because it feels wrong to pump a whole pool full of gross winter water through a brand new pump/brand new sand, but I guess that's what it's job is, so whatever! Thanks for the tip on the CYA granules... are those the shock bags? Aren't those usually supposed to be spread directly into the deep end? Thanks again! (And Thanks @domct203 too!) Really appreciate it! Welcome to TFP, the best place to learn how to put that new pump and filter to use. What test kit are you using and what are you referring to when you say "triple-shock"? Without accurate numbers from one of the test kits that we recommend, you could be adding more headache down the road. I honestly haven't even thought about which chemicals I'll need to add yet. I still have a bunch of PVC re-jiggering to do to get my pump and filter playing nicely. But it couldn't hurt to get the test going! I'll try getting you that info tomorrow am, thanks again. Powder shock treatments contain other stuff that could really make managing your pool chemistry difficult. One invaluable tool we use is our own high quality test kits that take the guess work out of what our chemistry is. Guess strips and pool store testing just don't cut it. We only recommend the TF-100 or the Taylor K-2006. Does this look like it would work well? It says it's a 4-way test kit, but I think the TF-100 is a 7-way test kit? It's not about how many ways it goes, but about what type of tests it contains. 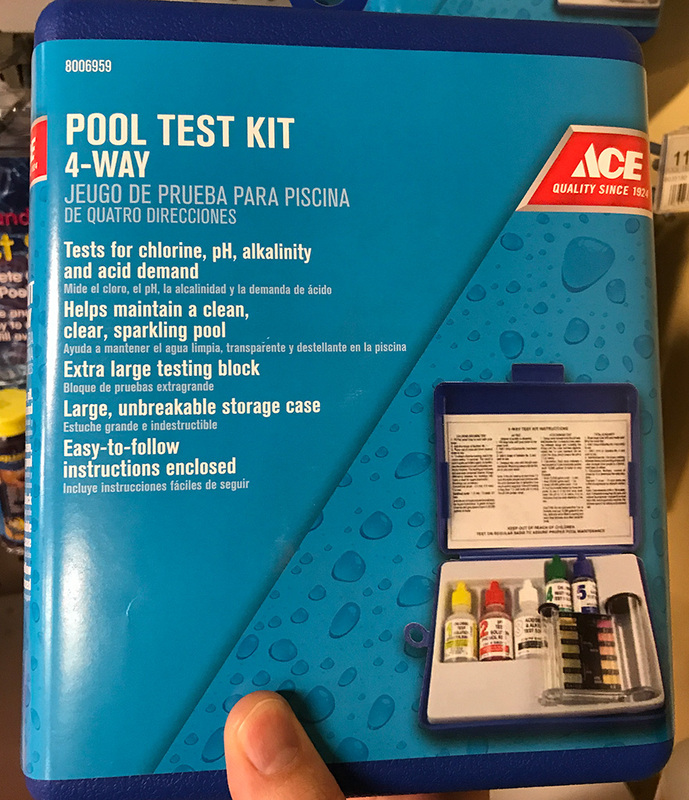 That kit has a standard OTO chlorine test, which is only good up to 5ppm, and it is a very opinionated test (matching color) without fine resolution. You need a FAS/DPD chlorine test that will measure FC up to 50ppm, with 0.5 & 0.2ppm resolution. The kits we recommend are the TF Testkits TF-100 ( TFTestkits.net ) and the Taylor K2006. The TF-100 is the best value for the money. Buying a proper test kit is vital for the TFP methodology. With the amount of money saved on everything else, it becomes a no brainer. We cant emphasis enough that the money spent on the test kit is actually a small investment that saves you tons of money down the road and takes all the guesswork out of what you NEED to add to your pool. Ok ok, I'll get the TF-100! After I receive it in the mail should I just post a new thread w/ my numbers?